FocalPoint Server came out of the “fires “of the London Olympics 2012. Its task was to manage existing users and the extra 200 freelancers who were not familiar with company work practices. The key was to make it simple so people would use it. Come and see FocalPoint server on Booth No. 7.J15W at IBC 2017, the largest media and entertainment show in Europe. What is FocalPoint Server Software? Launch your graphics or editing application through our gateway/simple interface that allows users to collaborate in the Cloud, WAN or LAN, and find their files in three clicks. We track projects from ingest to archive, ensuring correct naming of projects, bins and their storage location. We set project preferences for each job, with version control. This filtering or traffic light approach to managing users increases workflow efficiency and collaboration. As the number of users and department’s increase, the importance of this approach grows exponentially. Remote working via the Cloud reduces the cost of hotel, space and associated expenses while ensuring flexible working and collaboration. Other brands represented or distributed by Polar Graphics include StorageDNA, Studio Network Solutions, Mediaproxy, Apantac, Bluefish444 and Stardom. 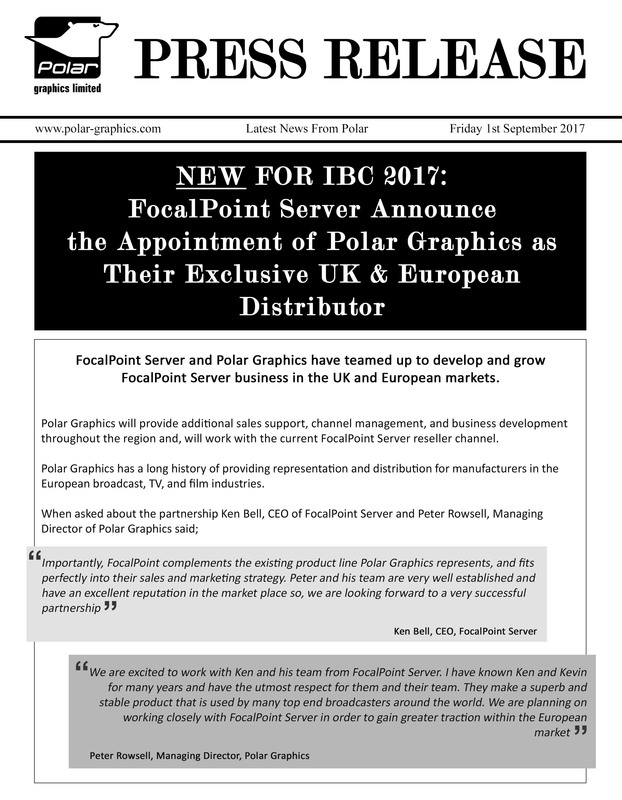 Posted in Company News, FocalPoint Server, IBC, Latest News, Press Release and tagged Asset Management, Hot News, Live Productions, Polar Hot News, Press Release, workflow solutions, Workflow Tool.